Top-secret documents obtained by the CBC show Canada's electronic spy agency has developed a vast arsenal of cyberwarfare tools alongside its U.S. and British counterparts to hack into computers and phones in many parts of the world, including in friendly trade countries like Mexico and hotspots like the Middle East. Revelations about the agency's prowess should serve as a "major wakeup call for all Canadians," particularly in the context of the current parliamentary debate over whether to give intelligence officials the power to disrupt national security threats, says Ronald Deibert, director of the Citizen Lab, the respected internet research group at University of Toronto's Munk School of Global Affairs. "These are awesome powers that should only be granted to the government with enormous trepidation and only with a correspondingly massive investment in equally powerful systems of oversight, review and public accountability," says Deibert. There's a lot in the CBC report that I won't try to summarize here. Go read it. See also this sidebar: Amber Hildebrandt, Michael Pereira & Dave Seglins, "From hacking to attacking, a look at Canada's cyberwarfare tools: The secret techniques developed by the Communications Security Establishment," CBC News, 23 March 2015. CSE's response to CBC's questions, a much less informative document, was also published. The NSA memo on the intelligence relationship with CSE was also released in redacted form by the CBC in December 2013 as part of these two stories. The redactions in the current version are nearly identical, but this time it is clearer that the document is actually four pages long. The current version also briefly left unredacted the fact that the "unique geographic access to areas unavailable to the U.S." that CSE provides to its U.S. partner is our "sites in the PRC", the People's Republic of China. - Christopher Parsons, "Canada has a spy problem," National Post, 23 March 2015. - Nick Taylor-Vaisey, "QP Live: The CSE is no longer a secret," Maclean's, 23 March 2015. - Martin Anderson, "‘Create unrest’: Canada’s CSE agency includes ‘false flag’ operations as part of newly-revealed cyberwarfare scope," The Stack, 23 March 2015. - Nestor E. Arellano, "Leaked documents reveal Canada’s cyber warfare tools," IT World Canada, 23 March 2015. - Dave Seglins, "Canada's cyberwarfare capabilities revealed," segment on The National, 23 March 2015. - The Intercept reporter Ryan Gallagher interviewed on As It Happens, 23 March 2015 (interview begins at 9:00 minutes). The Intercept's own coverage of the story is here. 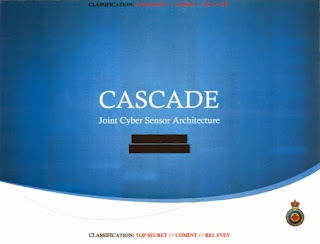 Added link to FVEYdocs.org copy of the slightly less redacted version of the NSA-CSE relationship document originally released by CBC yesterday. - Amber Hildebrandt, "CSE spying in Mexico: Espionage aimed at friends 'never looks good'," CBC News, 25 March 2015. - Iain Thomson, "Snowden dump details Canadian spies running false flag ops online," The Register, 24 March 2015. 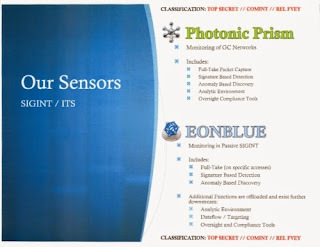 Christopher Parsons analyzes the newly released documents here: "Five New Additions to the SIGINT Summaries," Technology, Thoughts & Trickets blog, 27 March 2015.